CRS’ Youth Emergency Action Committees program strives to strengthen youth for effective emergency response and disaster risk reduction. The items are diverse, but they all have something in common—disaster risk reduction—which CRS applies around the world to reduce a disaster’s impact and ease the recovery process. In Bangladesh, cyclones are an inevitable part of life, but that doesn’t lessen their impact. Powerful enough to destroy the largest homes, the storms can devastate a poor family by leaving them homeless with their lives in tatters. CRS educates the most vulnerable people about disaster risk reduction techniques that reduce the impact of severe storms. This includes everything from putting important documents in sealed plastic bags to storing food in waterproof containers—and placing it all in high, but accessible places. Other techniques include using a moveable stove that can be transported to an evacuation center–and back again–so the stored food can be cooked. 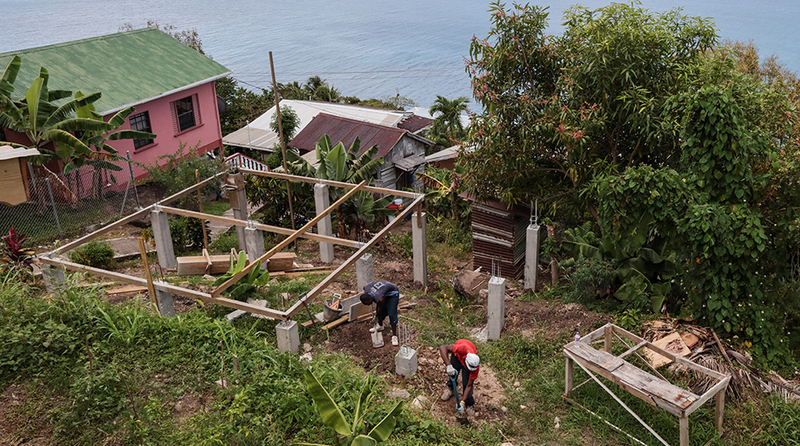 Building a raised foundation keeps possessions safe from rising waters, and reinforcing a roof means it survives intense winds. And, community members equipped with megaphones to announce an approaching storm can save lives. In the Philippines, people seeking inexpensive housing around Manila crowd their homes in low-lying areas vulnerable to rising water and storms. CRS helps community members travel through these communities with wheelbarrows collecting garbage that otherwise would clog the rudimentary drainage systems, making floods worse. The income they earn gives them a cushion that helps their own recovery when a storm strikes. In India, the agricultural practices of rice farmers have been developed over generations of dependable monsoon rains. But those rains are changing. Some places aren’t getting enough; others are getting too much. CRS works with agricultural scientists to find varieties of rice that can survive erratic rains as well as prolonged inundation during floods. By planting these new varieties, farmers will be able to withstand the shocks of the changing rain patterns. Households learn to plant vegetable gardens in cement sacks that can be picked up and moved to higher ground during floods. They are taught how to tie together empty plastic bottles to make lifesaving flotation devices, and a committee came up with an evacuation plan for the community when storms and floods are on the way. 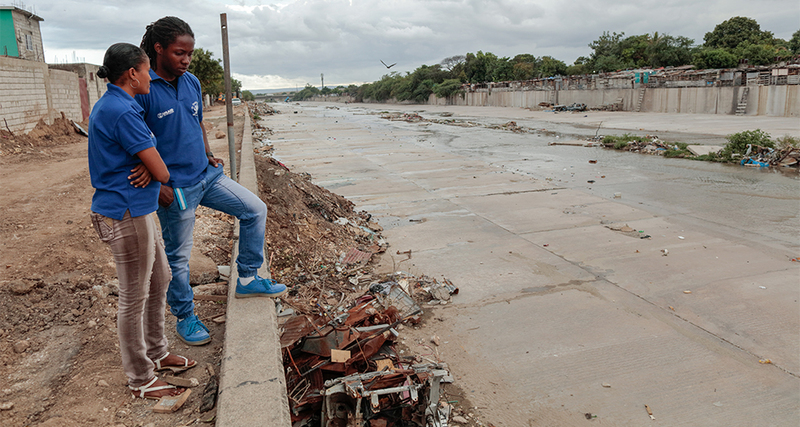 Youth Emergency Action Committee members inspect a flood prone area near the Waterhouse community in Kingston, Jamaica. The group participated in a post-storm clean-up effort. In Ethiopia–and may other places throughout Africa–disaster may mean not a storm, but a drought. CRS works with farmers on the best way to adapt to the changing climate. Planting a row of trees can help preserve precious topsoil, while other measures that restrict the runoff of the infrequent rains help maintain moisture levels, saving precious crops. Farmers also use cellphones to pass along information about weather patterns so they can decide how to plan for the coming season, discuss what kinds of seeds to use and what type of harvest to expect. Disaster risk reduction is probably part of your life and you don’t even know it—from building codes that ensure your house stays secure during a storm, to storm drainage systems that keep your neighborhood from flooding. We know disasters are going to happen, but with the right preparation and a little ingenuity, they don’t have to be disastrous. That’s what disaster risk reduction is all about.